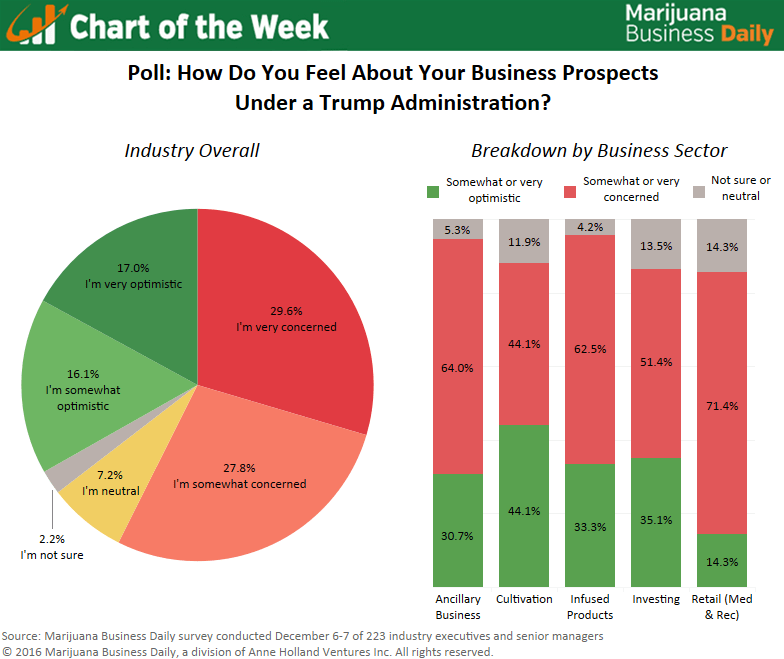 Over half of executives in the cannabis industry are worried about their business prospects under a Trump administration, with 30% saying they are “very concerned,” according to a poll by Marijuana Business Daily. The survey results underscore the general sense of uneasiness in the wake of the presidential election felt by many of those who run companies in an industry that is still illegal in the eyes of the federal government. Still, a fair share of executives – roughly a third of those who responded to the survey – are somewhat or very optimistic, believing the climate could get better for their businesses under Trump … or at least stay the same. The anonymous online survey, conducted Dec. 6-7, includes responses from 223 self-identified marijuana industry executives and senior managers. Trump’s victory in the presidential race and his subsequent selection of several anti-marijuana politicians to his cabinet has created a hefty dose of uncertainty in the industry. The president-elect has not put forth an official policy position on marijuana. How marijuana industry executives feel about their business prospects under Trump largely seems to mirror who they voted for in the election, though that’s certainly not the case for everyone. The 33% of survey respondents who said they’re optimistic closely resembles results of a previous Marijuana Business Daily poll conducted in late July in which 32% of cannabis industry professionals, executives and investors indicated they would vote for Donald Trump in the 2016 election. Looking at attitudes by sector of the industry, cultivators and investors are more bullish than their counterparts. Nearly 45% of cultivation executives and 35% of investors are somewhat or very optimistic about their business prospects under a Trump administration. Ryan Smith – CEO and co-founder of LeafLink, a New York-based wholesale management platform – has received questions from both investors and co-workers about what the Trump presidency means for his business. Smith said the company is moving forward as usual and actually handled more transactions on its platform this November than ever before. “We’re in the wait-and-see camp. No one’s freaking out or overly excited – there’s still a ton of market for us to capture,” he said. In terms of those most concerned about their business prospects under Trump, retailers led the pack. A whopping 71% of respondents who help run dispensaries or rec stores are somewhat or very concerned about their business prospects, while just 14% feel somewhat optimistic. Not a single retail respondent indicated they were very optimistic about their business prospects under a Trump administration. Aaron Varney, director of Dockside Cannabis, a retail marijuana store with two locations in the Seattle, Washington, area, thinks the election of Donald Trump brings a lot more uncertainty to the industry. It’s a question many in the industry are anxious to have answered. The libs almost always “fear” anything from the founders documents to small government today. Tear up the COLE memo and that will change the industry dramatically …. Buyers remorse ? We are all reading about the legalization of marijuana in a number of states. Sen Sessions, who will soon become the U.S. Attorney General will more than likely do all in his power (and that is a lot of power) to overthrow the wishes of the state. I had a dream last night that all of the states wishing to defy the Attorney General seceded from the United States, forming their own United Federation of States. I remember that in 2012, Texas was flirting with that idea. Seceding would not be easy, but it is possible. California, Texas, Washington, Colorado, Oregon and others would present a formidable number to the argument. Since we have been a nation, seceding has taken place 12 times. A majority of the remaining states would have to approve this. Most states are struggling financially. The money coming from taxing the Marijuana industry give millions each year to the states where it is legal. They won’t be ready any time soon to give up their pensions. That’s a ridiculous proposition which has about the same odds as winning Powerball jackpot. The operators currently practicing in the industry are positively optimistic. It is easy to focus on the worse case scenario, but for most of us, we are all in. There is no turning back now.